My favorite combination: sweet and savory, especially with brunch or breakfast. Prep the night before by baking the potatoes and you’ll be set for the morning. The jalapeno and the cayenne pepper add a pleasantly unexpected kick. -The day before, wrap the potatoes in foil and bake them at 350 until tender, about an hour for the sweet potato, and one hour and 30 minutes for the regular potato. Let cool. -Refrigerate overnight still in foil. 1. Remove potatoes from foil, cut into bite sized pieces, leaving the skin on the white potatoes but removing the skin from the sweet potatoes. 2. Melt a small amount of butter in a large frying pan, sauté the chopped apple for about 4 minutes or until slightly tender. Remove from pan and set aside. 3. Add vegetable oil to the pan and sauté the jalapeno for about 2 minutes. Turn heat on burner to medium high, add potatoes. Then add seasoning and give it a good stir. 4. Cook potatoes on medium high heat for about 15-20 minutes, turning them every three to four minutes, allowing them time to get slightly crispy on the outside. Stir in the sautéed apple near the end of your cooking time to let it get warm again. Note-To get a good texture, you’ll want to use a pan big enough so that all the potato pieces get to touch the bottom of the pan. 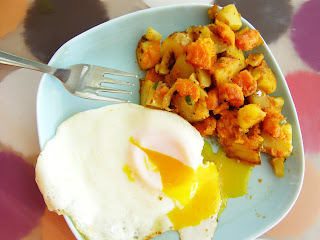 Too many potatoes hanging out up top can lead to soggy hash.